Lori Hairston: Sending Hedgehugs to You! Sending you hedgeHUGs. That's just adorable! My son-in-law, Paul, had hedgehogs as pets when he was little. He seems to think they are pretty awesome. The closest I've been to one is sweet Hedgie in Jan Brett's books. I have to say he is pretty awesome! The hedgehogs in this treat set are super cute I got the stamps first and then came across the darling paper for the treat bag. I already had the card made before I saw the hedgehog paper - it couldn't have been more perfect! Hopefully, you'll have a lttle something to package that would be a perfect fit for this little bag. Anyway, here's sending a couple of hedgeHUGs, just for you! Love your projects; esp the bag; it's darling. Oh Lori, your "Hedgehugs" are adorable. What lovely makes. Omgoodness, these are just SO sweet, Lori! I have a real soft spot for hedgies, too. We had two of them as pets when my kiddos were younger, so I just love anything with hedgies! Fabulous treat bag and love the shaker card! That paper you found is beyond perfect and I love the ease of the bag construction. Thanks for the directions! Awww.... Adorable shaker card and bag!! 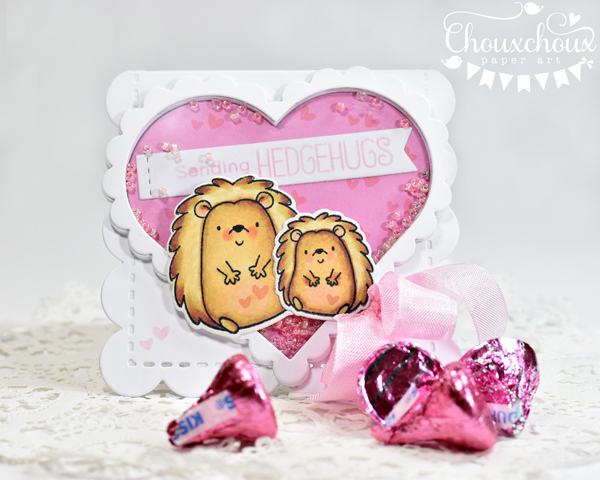 Love these cute hedgies and the heart with the shakers elements! Such fab paper for the bag!! Thanks for the tutorial, it's a really sweet, easy and quick gift to do!! So cute, Lori! I love the adorable hedgies! I also love shakers! Hmmmm, I haven't made any lately so I should do that! Your goody bag is sweet too! Awww...super cute! My son had a hedge hog when he was younger! Your projects with them are so fun and adorable! And, thanks so much for the tutorial!! Perfect is the best word for your makes Lori! Always a sentimental journey for me. I must admit, I have never heard of anyone having a hedge hog as a pet!!! Soooo adorable!!! I have almost bought that stamp set so many times! Lol. And the paper. Perfect!! Love these and the shape of that bag is pretty great. OMGOSH Lori.... That hedgehog paper is ADORABLE! 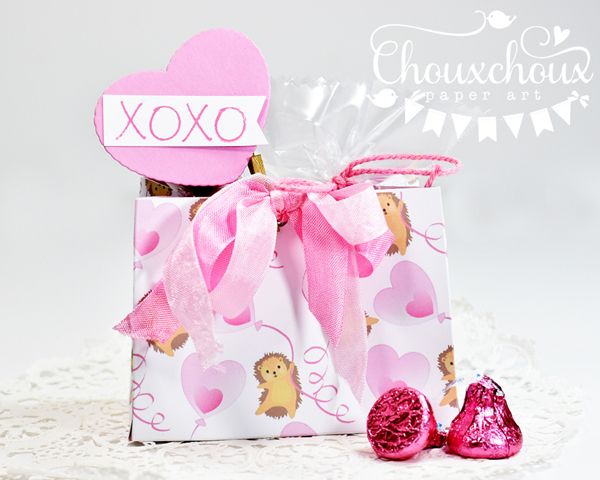 The card you made is so sweet.. this truly is a CUTE gift set! Have a wonderful day! Lori, what a darling, darling set!!! 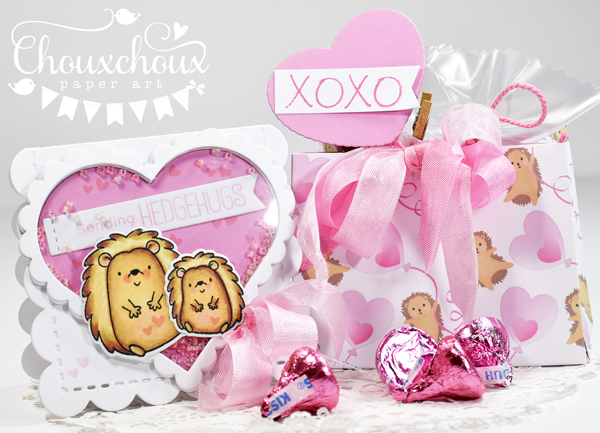 The soft pinks are lovely and those hedgehogs are adorable!! oh this is super sweet! Too, too cute, Lori! Your card is amazing with all the scallops & adorable hedgies & that paper is wonderful, as is the treat bag! Hope you had a nice Valentine's Day! Had to pin your card right away cause it's so stinkin' cute. Gotta try that design. The hedgie paper is darling. Such a sweet way to give a special treat. Hugs!